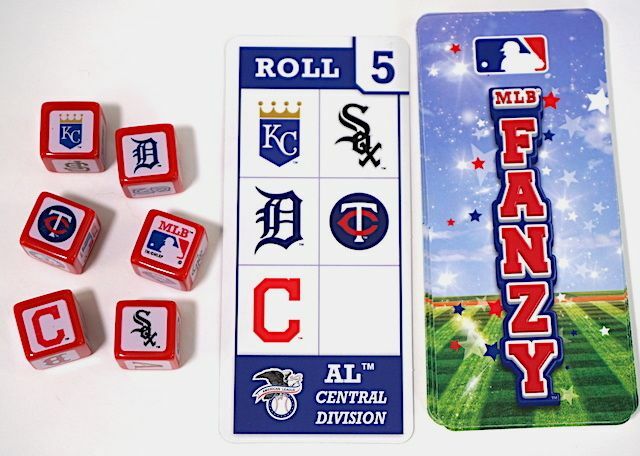 Fanzy is a sports-based speed dice-rolling game from Andy Geremia. Published by MasterPieces, it’s available in MLB, NFL, and NHL editions. Listen to our SNAP review of Fanzy in just 6 minutes, or read on below. 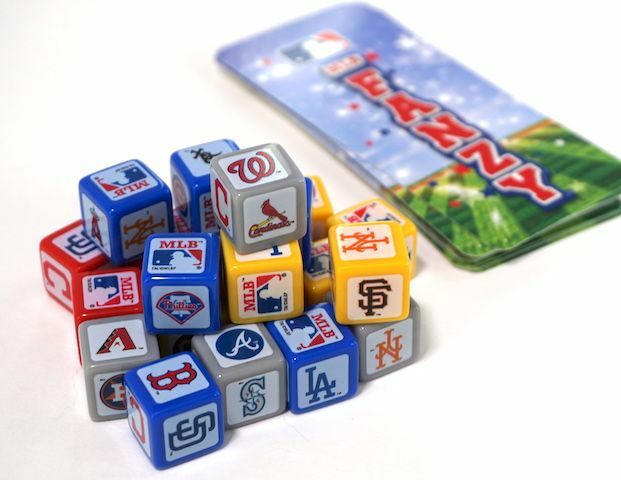 Fanzy is similar to Brew Dice, another dice game by Andy Geremia. Pick a card, all players simultaneously race to roll their dice to match that card. Set aside matching dice and keep rolling remaining dice. First person to match the card yells “Fanzy” and takes it. Each player gets 6 dice, containing all the team logos (30 for MLB, 32 for NFL, 31 for NHL). We discuss the MLB edition in this review. To keep the gameplay fresh, there are three ways to play Fanzy. “High Five” is the standard game, where everyone races for the same card, and whoever gets it first wins the round. First player to five cards wins the game. “Double or Nothin” puts out two cards at a time and the player who matches one of the cards first takes BOTH. “Shutout” puts out multiple cards: one fewer than the number of players. Each player takes a card once they’ve matched it (one per round). Last player doesn’t get a card (gets shut out). Again, the first player to five cards wins. The goal cards contain interesting combinations. Not just combinations like California teams, “Cactus League”, or American League Central, but also ones that will stretch your brain a bit even if you’re already a fan. “Flyover” is teams that have wings (Orioles, Cardinals, Blue Jays, Angels). “Splash Balls” for team parks that are right next to water or incorporate a water feature. 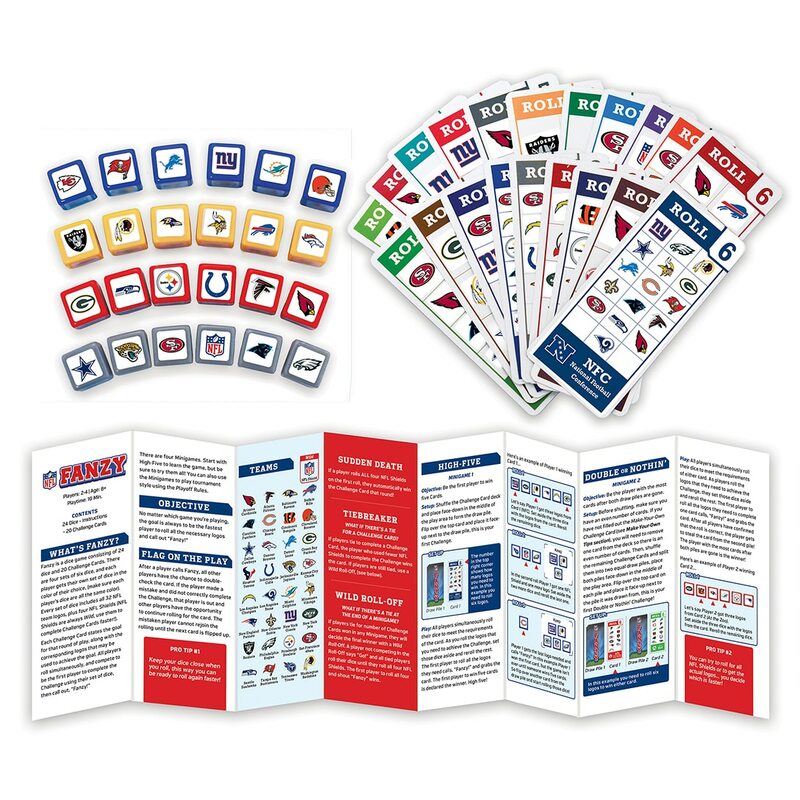 Fanzy cleverly incorporate the different teams in many combinations. We found MLB Fanzy surprisingly fun and engaging, and fun for spectators as well. Fans of the sport will have a slight advantage, but because of the unique combinations, non-sports fans can still play competitively. Very straightforward and simple, but fun. A great bar game or gift for a sports fan. This is a speed game, so younger kids will have difficulty. You can adjust it by handicapping (they only need to match 4 out of 6, for example) or making it a turn-based game instead of rolling as fast as possible. Buy Fanzy for about $20 on Amazon or at the MasterPieces website. The Family Gamers received a review copy of MLB Fanzy from Andy Geremia. Updated 9/30/2018 to include details for the NHL version.